Packed with edible ingredients, your skin will feel cooled and will be infused with antioxidants, minerals and essential oils to neutralise sun-induced free radicals. Rehydrate and repair your skin after sun exposure for a healthy long-lasting tan. 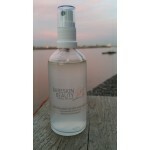 Spritz liberally over cleansed and dry skin, allow to be fully absorbed before dressing. Colloidal Silver, Magnesium Oil, Lavender Hydrosol, Aloe Vera, Frankincense Essential Oil, Lavender Essential Oil, Rose Geranium Essential Oil.